1. RIOC Board fires President Steve Shane, the saga continues. [Preface again: These are my personal comments, RIRA has not yet met to discuss this, so I don't know their opinions.] In response to my prior column and in response to RIOC Board members posting their statements on the Roosevelt Islander blog, it seems that residents agree with me that the RIOC Board has blundered here. As they say in the TV commercial "But, wait there's more ...". As confirmed by several people, the firing was prompted by privatization issues and there is the appearance of a conflict of interest (which could easily be resolved if the RIOC Board acted properly). 2. Meet Ms. Leslie Torres, the candidate for RIOC CEO/President. RIRA will host a town meeting Tuesday, August 3, 8 PM at the Good Shepherd. We hope the community comes out to meet the candidate and ask questions. Those residents who sent me questions at rira president@rira council.org no later than NOON Monday, August 2 will have their questions forwarded to Ms. Torres and will get first priority on answers at Tuesday night's meeting. 3. Disappointed in RIOC legislation. We have pending legislation on hiring a RIOC CEO/President (at least three candidates need to be interviewed and there must be a public hearing). The legislation has been modified as it has made its way through both houses, yet there has been little public awareness (Assemblymember Kellner should have made an effort) and there has been no discussion within RIRA Common Council members (a fault of my own organization). Essentially, the changes in the legislation change from two RIOC appointments by our assemblymember and senator, to two RIOC appointments in consultation with our assemblymember and senator and appointment by the head of the Assembly and the head of the Senate. Mr. Kellner believes that this is not a problem. My sense is: in the past year, we've seen the dumbest of lows in our state legislature, so having to lobby two other people (head of Assembly and head of Senate who know little about Roosevelt Island) just makes our voices even more diluted. Regardless, the community should be aware of this legislation. Considering that three candidates are necessary by this legislation, it is discouraging that the RIOC Board doesn't support the spirit of this law (by only interviewing one candidate) and the assemblymember doesn't advocate RIOC follow his own law that is pending approval by the Governor. In other words, although we have resident board members, they perform no better than the old-style state appointees, they change RIOC presidents without any explanation (can RIOC cite what statutes, regulations, or provisions preview the RIOC Board from discussing their recent actions? ), and the whole thing stinks of non-transparency and the appearance of conflicts of interest. 4. RIOC Board operating outside its By-Laws? Have you ever noticed that RIOC Board meetings involve "motions", "seconds", and "tabling" and so on? These words have no meaning in the context of the RIOC By-Laws. There is no Roberts Rules of Order (or any other rules of order), thus words like "motions", "seconds", and "tabling" -- and even votes on them -- are improper and give the public the wrong sense of what the board governance process is. To Mr. Leitner, Vice President / General Counsel or RIOC: I encourage you to have your board and especially its chairperson to conform to the by-laws of your corporation. 5. 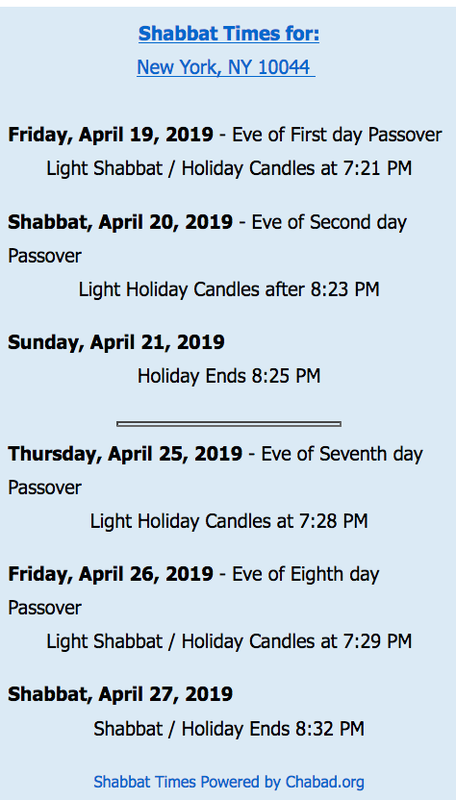 Upcoming RIRA meetings. Aside from the short-notice town meeting (see above), the next meeting is on September 15 at 8:00 p.m. in the Good Shepherd Community Center; future meeting is October 6. Have a great summer! A version of the RIRA President's message is also published as the RIRA column in the 7/31/10 Main Street WIRE. Roosevelt Island on the Web Links as appearing in the July 30, 2010 Main Street WIRE. Wall Street Journal - Roosevelt Island Better Than Suburbs? Curbed - Price Increases At Riverwalk Condos? 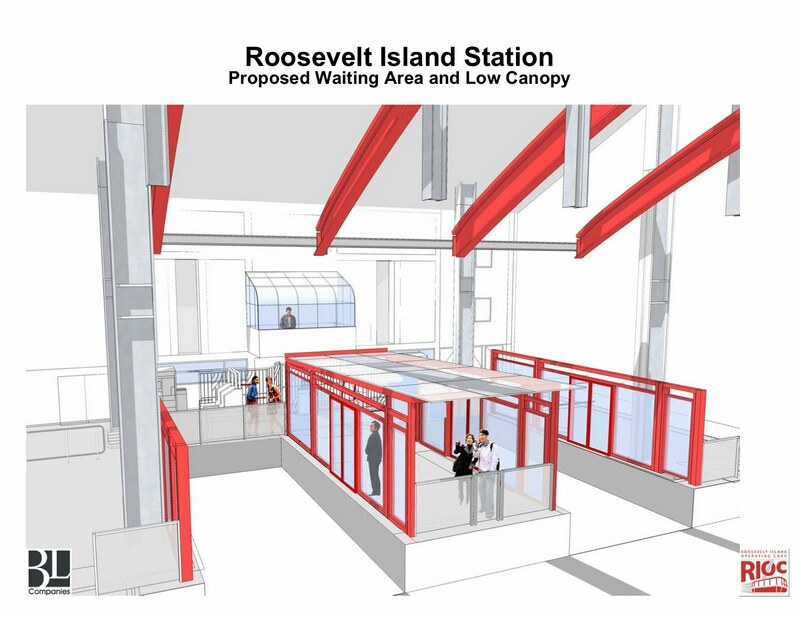 and Roosevelt Island Stations by BL Company's Maria Wilpon. 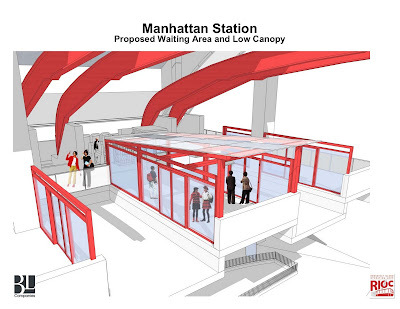 Among the proposed design elements for the stations is a low red canopy for the waiting area providing protection against harsh weather elements such as rain and cold - the area can be heated during the winter months and sliding glass doors that will open for the arriving Tram cabins but will be closed during all other times. There will also be an opening between the sliding doors and canopy to provide air circulation for the waiting area. The full presentation is below with the proposed floor plans including increasing the number of turnstiles for the new stations and enlarging the waiting area. You can follow the entire presentation by listening to the Operations Committee web cast. 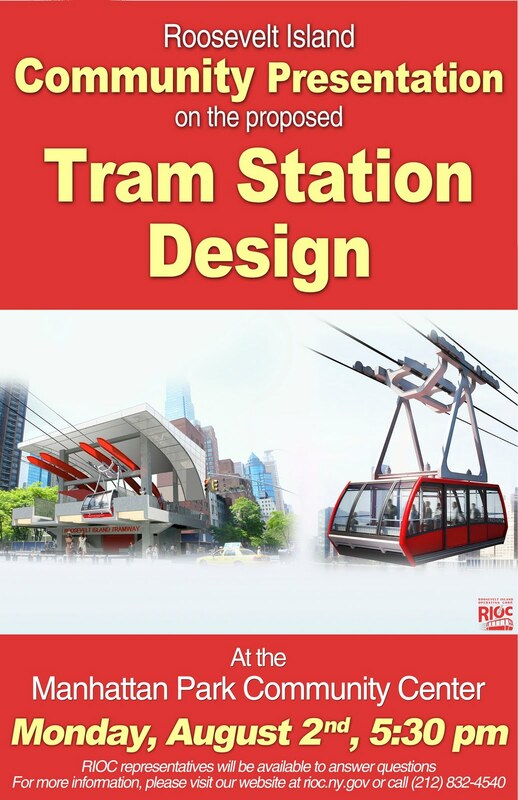 There will be a special community presentation of the proposed Tram Station Design on Monday, August 2nd, 5:30 PM at the Manhattan Park Community Center (8 River Road). Representatives will be present to answer questions. RIOC Interim President/CEO Steve Chironis sends the following report to Roosevelt Island residents. This is the first RIOC President's report since the June 28 departure of former RIOC President/CEO Steve Shane. “Business as usual”! The executive staff is committed to working together in order of making the transition period as efficient as possible. 1.) Tram Opening – As of the July 27th progress meeting the south lane is scheduled to open on September 27th and the north October 7th. 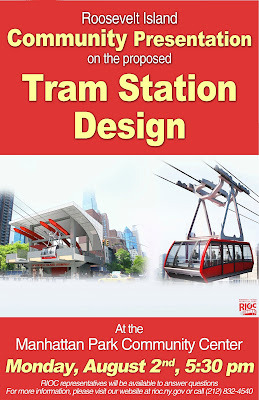 The stations design should be finalized within a week. The majority of construction work for the stations will be performed after the opening of the Tram but will not require the closing of the Tram. 2.) Retail Master Lease – a few important remaining issues related to the RFP still remain but hopefully an RFP to be issued within the next several weeks. 3.) FDR Memorial – phase I construction on schedule, initial phase II discussions in progress. 4.) Southpoint Open Space (Green Rooms Wild Gardens) – initial opening of paths only expected in the fall. After fall plantings full opening expected in Spring 2011. 5.) AVAC – façade work completed, installation of new compacters in progress. 6.) Octagon Soccer Field – new lighting, excavation and grading completed. New field to be completed by the end of this month. 7.) Island Security Camera System – phase I (installation of cameras from Motorgate to 504 Main Street) to be completed by the end of this month. 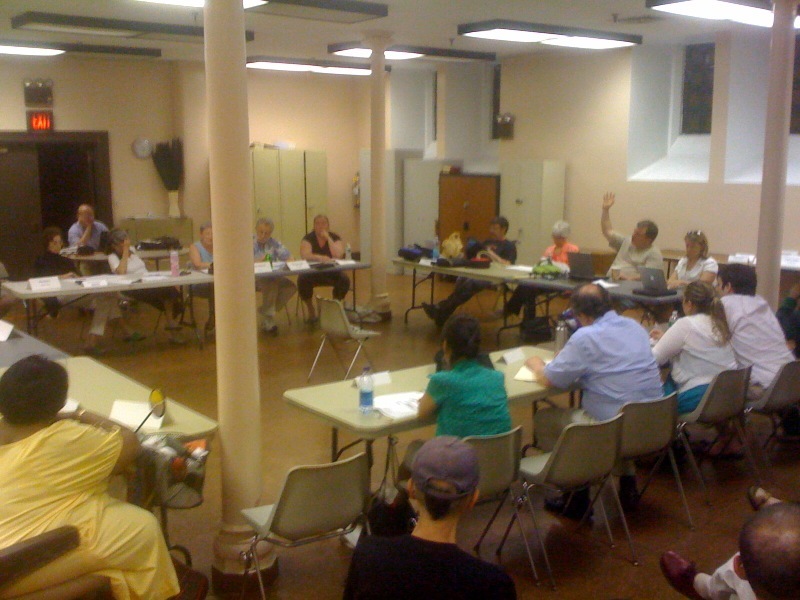 Phase II ( from 504 to Southpoint Park) discussions in progress. 8.) Motorgate Roof Waterproofing & Stairwells – project about 35% complete with estimated completion the end of November. 9). Motorgate LED Lighting – Design and engineering in progress. 10.) Helix ( Bridge Ramp) Engineering Investigation (LiRo) – Good news! The preliminary report from LiRo shows that the helix surface does not have serious structural damage. The full report should be completed by next week. 16.) Expanded Sportspark Activities – see website for expanded pool, ping-pong and basketball hours and the new exercise workout room. 17.) Soccer Night – Come out and celebrate the opening of the new soccer field. Activities will include free clinics provided by the “Red Bulls”, a major league soccer team. 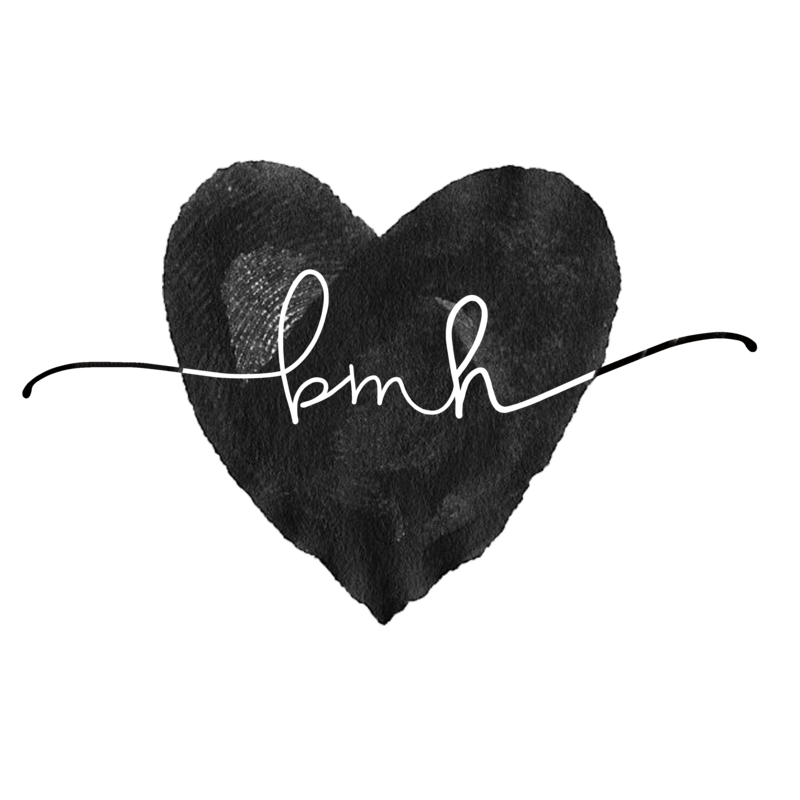 Date & Time to be announced. This message also published as the RIOC column in the 7/31/10 Main Street WIRE. Conscious Cycle is a filmed interactive art environment that brings artists and community members together in an effort to explore, educate, and learn about Conscious living and life's Cyclical nature. Conscious Cycle consists of the following: We reclaim discarded wood, build a wall out of it, and invite artists to paint the wall, one after the other, while being filmed for a time-lapse movie. Mural themes revolve around Consciousness and Cycles. Throughout the event, djs play music, dancers perform, yogis and tai chi practitioners teach and demonstrate, artists collaborate, and community members are encouraged to interact with the materials and us. 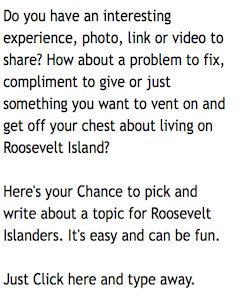 Does not sound like your typical sleepy Roosevelt Island weekend. UPDATE 8/18 - More cool pictures here. ... provides an update to which some Directors agreed to present, or sign, as individuals. This is not a "Board statement". We realize some residents may be unsettled by the change of administration at RIOC. First of all, we want to assure everyone that RIOC staff’s primary work, supporting our common community, continues unabated. RIOC’s services continue to maintain the basic fabric of our community while many improvement projects advance. With the transition currently going on right now in RIOC we want to take this opportunity to assure the residents that projects are going forward on schedule. Beyond the normal buzz of activity to support comfort and safety here in our village, its been a very busy summer. Many of the Directors have met with senior RIOC staff in recent weeks. We are all impressed by their efforts to bring all current projects forward with a great spirit of mutual support. Steve Chironis, CFO and Acting President, has created a very collegial atmosphere, with great interdepartmental cooperation among Fernando Martinez, Ken Leitner, Rosina Abramson, and the other department heads. We thank them and all their staff. Their attention is spread across many projects and concerns all around the Island. Parks and ballfields are being developed. The Chapel plaza is being rebuilt. Good Shepherd Chapel itself will receive desperately needed heating and air conditioning, and plans advance to refurbish its roof. Better, highly efficient lighting is planned throughout the island. The AVAC system we all quietly rely upon has been repaired. Advanced wireless network infrastructure installation continues, in part to enable security systems supported by Congresswoman Carolyn Maloney’s funding efforts. An incident tracking system is in development, like our own 311, so that there will be a uniform and transparent way to report problems and see their resolution. Motorgate is receiving a state of the art efficient led lighting upgrade, and installing solar panels and electric car charging posts is under consideration. The helix adjacent to Motorgate has been tested and found to be worn but serviceable, with some patching now, but with enough lead time allowed to permit an orderly, and much less intrusive repair process, to occur within the next five or six years. Three buildings with over 1,100 apartments are under this 30-year old housing program. Graceful exits from this middle-class housing program are sought. A variety of state and local agencies have input into a process of recreating a mix of taxes and fees that remain low enough to permit a next-generation template for affordable housing to evolve. RIOC has a direct role through its assessment of ground rents, and an indirect role as the local, but very junior, state authority, to influence the other authorities, and act as a focal center for discussions. The Board has lead RIOC to resolving to accept the state housing authority DHCR lead in determination that certain proposals are truly new affordable housing models. Accordingly, following our Master Plan and Mission, RIOC is resolved to grant affordable ground rents to enable affordable housing. Accelerated activity has brought us to the final phase before release of a Request for Proposal (RFP) for a Master Lease. The benefit of this operational change is to seek an experienced operator who will work with current and future merchants to build a vibrant Main Street. We intend that merchant variety and locations may be reconsidered in creative ways so that an attractive and thriving town center may quickly begin development, to serve all our community. The Board has driven this effort, as the best means to solving this very long-term issue. Instead of clumsy efforts to make piecemeal utilization decisions and put leases through a lengthy RFP, review, and Board approval mechanism, we intend to have a professional operator whose incentive is focused on increasing our merchants‘ success and our satisfaction. We intend increased community involvement as this process evolves. We continue to monitor this project, and now expect that the Tram will resume operation at the end of September. We are pleased that budgeted funds are sufficient to permit station improvements. Efforts have been directed to improve comfort and safety during waiting times with some refreshing of the basic station designs. These changes are within budget and may be accomplished in short order. We are also considering improving the existing ADA access, but permitting and budget issues may require a slower track to completion. Public meetings are planned to present the proposed station designs. A continued schedule of Committee meetings and a special Board of Directors meeting in August reflect our devotion to serving this community through directing RIOC. Please attend meetings. Speak to us through directors@rioc.com or through phone messages to the RIOC office at 212-832-4540. RIOC Director David Kraut did not sign the statement. Me not signing that statement was no big deal. I just couldn't see the sense of it. We're not allowed to talk about the subject that is most on peoples' minds, so why fill up space with a laundry list of stuff the corporation was already doing anyway? Are you a resident of Roosevelt Island's Rivercross Mitchell Lama Cooperative and interested in learning more about what is going on in your building? If so, consider joining with some of your neighbors as they meet to discuss common interests of concern and find solutions to existing problems. d) the active search for a window washer. In regard to the window washing, the attendees did a quick calculation and noted that the three year non expenditure of the former $25,000 per year window washing would pay for a $75,000 'new rule' contractor at the indicated price of $75,000. If the Board were to go on a three year cycle, this might be considered. 2) Mary discussed the 'dogs in Rivercross' ideas. The upshot of the conversation was that if changes in the present 'no dog' policy were to be made, that action should be taken to change the rules before privatization were to occur. Dog owner responsibility on the Island generally was discussed at some length and referred to Fay Christian, as a RIOC Board member, who was sitting with us. 3) Harriet reported on her conversations with a company that provides a complete co-generation package. The next steps involve a two year review of electric bills for the cooperative, and looking at the details of the physical plant that is involved in the electrical systems of the building. 4) Arline reported that a Rivercross shareholder, Mary Lou Risley had offered a tour of a green roof building in which she works. Gilda suggested some reference books that she had been responsible for that detailed green roof installations. 5) Ekaterina reported on her determination to understand the recent court decisions on the surcharge. The consensus was that the current Board seemed dead set against raising the surcharge, largely on the sense of having sympathy for people whose incomes had increased significantly since meeting the Mitchell Lama limits when they entered the cooperative. 6) Steohanie opened a spirited discussion of the good effects of having ongoing social events for the cooperative. What is needed now is the necessary group of volunteers to manage the events. 7) During the course of the several discussions it became clear that there should be a mechanism to permit all shareholders to vote on the matters that are important to them. Among them are the matters of dogs, surcharges, term limits for Board members, allocation of shares. Possible courses include a petition to the Board from 25% of the shareholders, and then approval authorized by a yes vote from 65% of the shareholders. Meeting adjourned at 8:45 to meet again on Tuesday August 10 at 7:30. There is also an online Rivercross Google Group for residents to communicate with each other as well. Received the following message commemorating the 20th Anniversary of President George H. Bush's signing of the Americans With Disability Act from Roosevelt Island Disabled Association (RIDA) Vice President Nancy Brown. Today is the twentieth anniversary of the signing of the Americans with Disabilities Act by President George H. Bush. It marked the beginning of major changes for the disabled community of America. What the ADA mandates: Employers may not discriminate against a person with a disability in hiring or promotion if the person is otherwise qualified. All new public transit buses and rail cars must be accessible. New buses and rail stations must be accessible. Thirteen years from today all subway stations must be accessible. 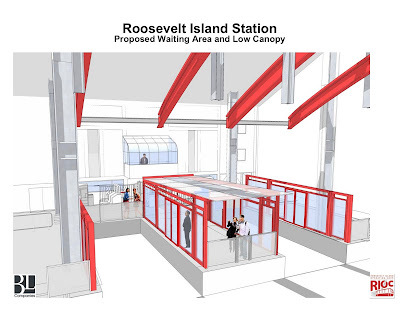 (Roosevelt Island’s station already is accessible and 17% of the subway stations in the city are, as well.) Restaurants, hotels and retail stores may not discriminate against the disabled and all new construction and alterations must be made accessible to the disabled. The signing of the ADA has enabled people with disabilities to be happy in their independence and become more productive members of their communities. This is evident right here on Roosevelt Island where many of the disabled hold down jobs, attend community board meetings and are presidents of organizations. Virginia Granato is a member of the Goldwater Community Board, Jim Bates is president of the Roosevelt Island Disabled Association and Dolores Green is president of the Roosevelt Island Seniors Association. They, and many others, are visibly active and productive members of our community in part as a result of the Americans with Disabilities Act signed by President George H. Bush on July 26, 1990. More information on the American With Disabilities Act is available at the ADA National Network and here is how the Anniversary was celebrated this year at the White House. The Roosevelt Island Youth Program in collaboration with the Roosevelt Island Operating Corporation have begun their annual Summer Basket Ball league on Mondays and Wednesdays 6:30PM to 9:30PM. The 16 to 20 year old league is very competitive and the location is great at Blackwell Park and the price is right; It's FREE. Please be advised on Wednesday, July 28th between the hours of 12:00 p.m to approximately 4:00 p.m. there will be intermittent street closures and diversions from the East Channel Drive to facilitate the delivery of equipment via barge for the tram project. Public Safety Officers will be on site to direct traffic. We appreciate your patience during this small period of time. including this close up of the traveling Bridge. Roosevelt Island 360 also saw the Bridge passing Roosevelt Island and sent in this photo. 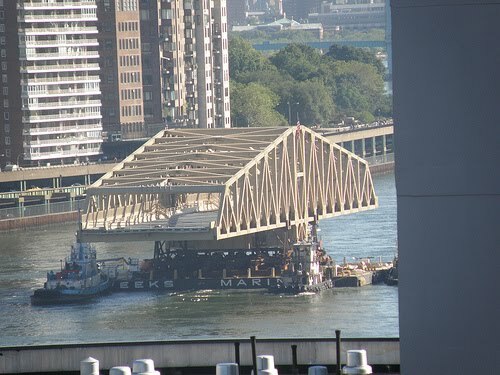 More on the Willis Avenue Bridge's trip from WNYC and it's construction from the NY Times. Below is video of Fox Good Day New York interview with NYC Department of Transportation Commissioner Janette Sadik-Kahn regarding the new Willis Avenue Bridge and other East River Bridges. Near the end of the interview, at the 4 minute 30 second mark, Ms. Sadik-Khan says that all work on the East River Bridges except the Brooklyn Bridge has been completed. I guess she forgot about the current work being done on the Roosevelt Island Bridge. Attached please find an Important Notice from the New York City Department of Transportation with regard to the upcoming overnight closures of the Roosevelt Island Bridge. Artificial Turf Installed At Roosevelt Island's Octagon Field, Will Open In Mid August - Who Gets To Play On Field? I was walking by the Octagon Field over the weekend and noticed that the artificial turf has been installed. What is the next step and do you know yet when the field will be available to use. Also, will the field be available for use by anyone when there is not a a group with a permit using it? Pick up games etc? The contractor is addressing some punch list items. We are planning a ribbon cutting event before we open the field to the public. A date has not been determined, but we are looking at sometime in mid-August. Pick-up games that involve a small group of people and that are not a regular occurrence, in general, will not be a problem. Probably need to clarify what pick up games involving small groups on a non-regular basis not a problem means to RIOC. Low Flying Plane Over Roosevelt Island Barely Makes it Over Queensboro Bridge This Morning - Is That Normal? I was facing the bridge near the tram station and saw the small plane flying toward the lower level of the Queensboro bridge over Roosevelt Island. At the last second it went up and over it. It barely made it over. I don't know if that is normal, but it seemed very close. I did not see the low flying plane today but I frequently do see seaplanes flying pretty low and close to the Queensboro Bridge and Riverwalk Buildings. A post last week linked to recent Wall Street Journal article about Roosevelt Island's new Riverwalk luxury rental and condo buildings in Southtown. But what about some of the other areas of Roosevelt Island - for instance, what is it like to live at the Manhattan Park complex in the northern section of Roosevelt Island? I am deciding on whether or not to move onto RI and Manhattan Park in particular. Can you give me some feedback? Do you like RI----what about the commute into Manhattan. I am moving in with my wife and kids. Roosevelt Island is great for kids. Hardly any traffic or any noise for that matter. Depending on where your going to work, your commute shouldn't be that bad. Currently the tram is out of commission but only for a few more months. We do have the F train that stops here as well. We live in Manhattan Park and I like it a lot. I'm not sure about the other places. There are many other newer buildings that have gone up in the 4 years since I have moved here. Good luck with your searching. It is extremely crowded on the F in the morning. I sometimes have to let a couple trains pass by before I can get on. It's not bad on the way home though. Actually it depends. If you get on the train any time before 8:15, it's usually not bad at all. I got on the F this morning about 8:10 and it wasn't crowded, there were even some seats. Kids: with kids that age, I'd say the value of RI turns more on the amount of apartment space you get for your money. You won't be interested in all the playgrounds, playing fields and other things that make the island great for small kids. Amenities: Your mileage may vary, but I suspect you'll find RI much less convenient than the suburbs. The island retail situation is very poor, with the exception of the Saturday farmer's market, which is great (although technically not a true farmer's market). The restaurants are mediocre at best and the variety is weak. There are no other decent shops to speak of, no florist, no specialty food vendors, no liquor store/wine shop, possibly the worst hardware store in the history of the western world, etc. I could go on but won't. If you have a car, you'll be using it a lot. If you don't, you'll be traveling at least 30-45 minutes one way to get shopping done every single time. That Manhattan experience of walking out your door and having the vast array of retail within 5 blocks simply doesn't exist here. What you will get is quiet, terrific air quality, good views. A tremendously diverse populace. A creaky and dysfunctional bureaucracy. Simmering resentment between long-time islanders and newcomers. Some fun community events. I guess thats all true, but you do have to give a little to get a little. A similar apartment on the other side would be double. True that there isn't much here on Roosevelt Island, I find it a very nice, quite, safe feeling place to live. I agree with (name deleted - #3) on his feeling about the lack of retail here. There just isn't any. A handful of restaurants all of them just ok but good enough to go to on one of those I just don't feel like cooking nights. (except the Trellis Diner it had issues last summer and seemed to be shut down by the health department a few times I won't go there anymore). 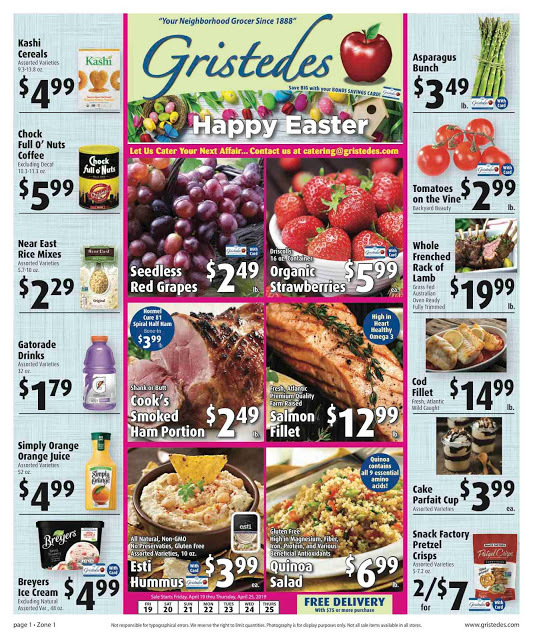 The only grocery store on the island is a Gristedes. If you have to shop there be very careful. I have bought things that were expired. Bad me for not looking but now I do. I only go there if I need something. I think the Farmer's Market on Saturday mornings is great but not as good as the big Farmer's Market in Union Square that one is fantastic. I have a car so I go into Queens to shop there is a Costco, Stop and Shop and Pathmark very close by. I occasionally use Fresh Direct. They are an online grocery service and they deliver right to your door. I also recommend signing up with Netflix if you like to rent movies. If you do have a car, I want talk about the parking garage on Roosevelt Island. It costs about $200 a month to park your car. There is no security in the garage. We have had our car vandalized, tires slashed and our gps stolen out of it. 2 separate times. There are zip cars right on Roosevelt Island if you need to use a car and don't have one. If you're able, you should come visit the Island before you move but if you can't, I think you will be happy here. It's just a matter of figuring out what will work for your family. There are so many options for you to choose from. I don't think the morning commute is "extremely crowded" - it does depend on what time your morning commute starts. What time do you need to be at work? If you have to get on the train at 7:30/8, like I do - it's fine, I think its the people that get on the train at 8:30 - 9:15 that wind up getting squished. 8:45 is the worst of it (in my opinion), but even then I've only let one train at most go by before getting on. My husband and I have lived here for two years and we love it (mostly that it's quiet at night and I can see water from my apartment). Feel free to ask any questions (that goes to anyone). I would add that the cost of electricity seems to be an issue at Manhattan Park. There's also an outdoor swimming club and tennis courts only steps away. Also, in regard to comment about the restaurants. I think the Riverwalk Bar & Grill is a pretty good neighborhood restaurant that provides a nice place for the community to relax, socialize with friends, meet new people and have a good time. 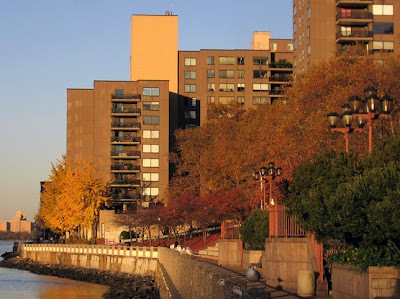 More thoughts regarding living on Roosevelt Island from prior posts. Thanks to the members of the Manhattan Park Residents Google Group for permission to post their exchange. There are Google Groups for all of the other Roosevelt Island Buildings as well. For those interested in joining their building Google Group, links to them are at the top of the middle sidebar. Jazzmobile, the longest running New York City Summer Jazz Festival, is returning to Roosevelt Island's Good Shepherd Plaza tonight at 7 PM with a performance by Jazz Vocalist Ghanniyya Greene. 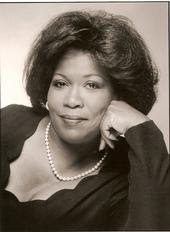 For a taste of Ms. Greene's repertoire, check out this rendition of In A Sentimental Mood plus other selections from her song list. Here's previous visits to Roosevelt Island by Jazzmobile.